Hello everyone, I hope you guys are doing well. Today, I thought I would take break from engineering topics and discuss four important considerations for a work wardrobe. I know this can get far more detailed and will apply differently depending on the person and job position. However, by working on these four general considerations, you can improve your wardrobe a lot in regards to looking well put together and professional. This is one consideration that can be applied to all types of clothing and the various situations at work. If the clothing is too baggy or tight when you wear it, it will make you look unprofessional. The fit that works best will vary depending on body type and it’s something I’m not completely knowledgeable on myself. However, there are plenty of resources on the web to figure this out. My recommendation is to take 15 minutes to do some basic research on standard clothing fit and trends that work for your body type when you go shopping and it will improve your appearance a lot. This is one of the clothing topics that is not discussed as often as it should be in my opinion. Everyone knows some basic rules like a black suit being traditional for weddings and funerals. Another common one is navy blue for sales and a check or stripe pattern for a bolder yet professional appearance. To give an example the opposite, it might look funny khaki dress pants to an evening event – a better option for something casual would probably be blue or gray. Again, I am not expert on this but look some stuff up on-line and it will go along way in improving your outfit choices. Your wardrobe will be far more useful and you will have more outfit options if you consider what you already have when buying clothing. You will also have a wardrobe that is more versatile in variety of situations if you buy clothing that can be used for multiple purposes with multiple outfits. Furthermore, you look sharper because you can create more unique outfits. There are several opinions on the optimal level of variety and versatility; but as long as an effort is made to consider this basic concept, it will improve your wardrobe. The bottom line is that there no one right way to dress. There are guidelines that are suggested and some are definitely more important than others; however, good style and confidence can trump some of those guidelines. So my recommendation is have fun and find something that you feel good wearing, then you can apply the above recommendations accordingly. If you want some good resources on style and clothing in general I recommend these two blogs: i am alpha m and real men real style. Do you guys agree with these recommendations? Is there anything you would add to this list? Feel free to like and share the post if you enjoyed reading. Thanks for your time and have a good week! Hello everyone! I hope everything is going well. This week I would like to talk about the incorporating “green” elements to city planning. I read an article a while ago that pointed out some interesting aspects of city life. Most people who live in cities don’t notice nature around them in cities, instead they go on vacation to find nature. Furthermore, more and more of the world’s population lives in cities. Traditionally, the use of green space has been an aesthetic concern rather than a requirement for psychological health. In addition to that, most urban planners haven’t claimed ownership of the issues related to lack greenery in the cities. However, that is changing in Detroit, Europe and Singapore. The researchers believe that greenery needs to be incorporated into urban planning from the ground up. While I think that some of the contributors come across as overzealous at moments, I agree with the concept. Some of my most relaxing moments when I lived in Arlington, TX were the times I spent running at River Legacy Park. It was a park that had a great section of in which I could loose myself in nature and reach a zen-type running state. This article highlights benefits of incorporating nature that I have experienced myself. What are your thoughts on incorporating nature into cities? Do you agree with the articles assessment? What would you do to incorporate nature into cities? If you enjoyed the post, like it and share it with your friends. Thank you for your time and have a good week! Trust yourself. Create the kind of person that you will be happy with all your life. Make the most of yourself by fanning the tiny inner sparks of possibility into flames of achievement. Great quote. It speaks to the truth that accomplishment and happiness is achieved one step at a time. Hello everyone! I hope everything is going well. Today I would like to talk about some potential uses for bamboo that are being incorporated into building structures. Bamboo is most commonly used as a structural element in middle and lower income housing in China or Latin America. It’s usage has started to expand to the eco-tourism structures as well, but is still mostly used for it’s aesthetic appeal in main stream structures. 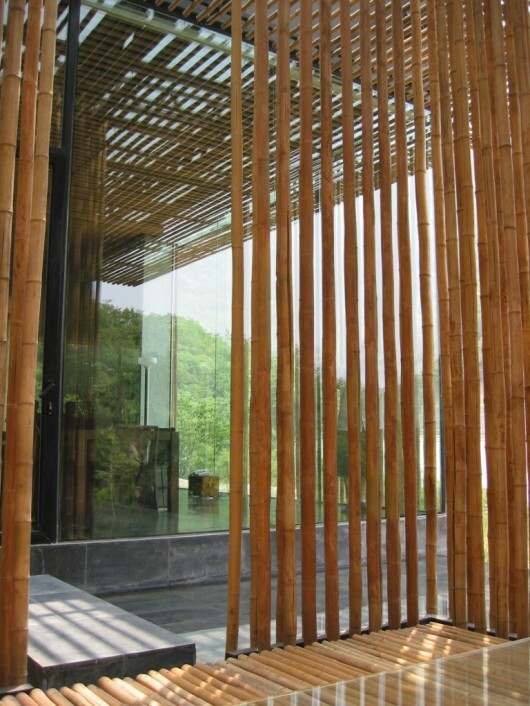 Bamboo has previously not been considered useful in structural building design in comparison to other materials. However, there are some properties that could be useful. Bamboo is flexible, shock resistant, and more readily available in certain areas of world. Below is a list of three applications involving bamboo that could be useful for building design in my opinion. The flexibility and shock resistant nature of bamboo could make it a very useful wood framing material. There are certainly stronger and stiffer wood framing materials available on the whole. However, depending on the accessibility and the requirements of the structure, bamboo could meet the load capacity demands. Furthermore, methods such as the ones listed below could be applied as well. The bamboo can be linked together to create a wall. It can be curved or straight and be equally easy to construct/build in both methods. The solidity of the wall can be changed as well. The article source mentions a process where the bamboo is cut in half, hooked to the next section, and then linked together. There are plenty of creative options for creating a wall that follows this basic principal that would replace a traditional wood sheathing wall. The bamboo can be filled with concrete to increase the overall stiffness and crushing strength of the bamboo system. The way that best describes the benefits is modern masonry – the only difference is the location of the different elements. For masonry, the exterior part provides the stiffness and crushing resistance while the interior reinforcement provides the flexibility and tension strength. It would be the opposite in the case of bamboo. Using this method, the load bearing capacity of a bamboo wall, floor, or framing system could be greatly increased. What is your opinion on the use of bamboo in building structures? What is your opinion on the applications mentioned above? Are there any other applications you can see being beneficial? If you enjoyed the post, like it and share it with your friends. Thank you for your time and have a good week!